The Doke Silver Needle White Tea shows how this family run garden is constantly innovating (Chinese Silver Needles are only harvested once per year). 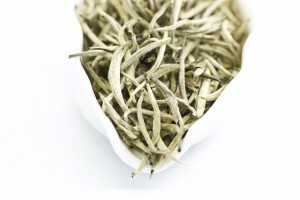 Like most Silver Needle White Tea’s from India, these leaves are loose and slightly darker yet here this simply concentrates the delicious white tea flavors – a truly extraordinary Silver Needle tea. Only the freshest tender young buds, covered in a delicate soft white down, are selected and brew to produce a clean and smooth liquor that’s simply bursting with fresh white tea flavor. Large, downy needles produce a sweet and creamy, full-bodied golden liquor with notes of peach blossom and dried apricot. This is a unique selection from a little-known origin. Key Flavours: Delicate hints of peach blossom, dried apricots and straw with a lingering sweet aftertaste.